Venez vous détendre et créer des souvenirs durables dans notre grand condo spacieux. Dernier étage (accès par ascenseur), unité d'extrémité avec vue imprenable sur le lac et la montagne. Grande chambre et la chambre principale ont des téléviseurs LCD et lecteurs DVD. Plafonds de neuf pieds avec meubles bien aménagés, planchers de bois franc, carreaux, tapis et comptoirs en granit. La cuisine est bien équipée pour vos besoins de cuisson et de service. Vous allez adorer les vues de 2 ponts - grande terrasse hors grande salle avec barbecue en acier inoxydable et une plus petite terrasse semi-privée de la chambre des maîtres avec table de bistrot et 2 chaises. Fantastique pour votre café du matin ou une séance de planification en soirée pour le lendemain. Jardins magnifiquement paysagés et pelouse où les familles peuvent profiter de croquet, badminton, hackey sac etc (apportez vos propres jeux / activités). Piscine d'eau salée conçue pour les familles, d'une profondeur de 1 à 5 pieds, idéale pour les enfants et les adultes. Pour les aventuriers, le lac et la zone de baignade à quai est fabuleux. Pioneer Walkway, un sentier au bord du lac situé juste à l'extérieur de notre complexe, est idéal pour les promenades matinales ou nocturnes, les balades à vélo, le patin à roues alignées ou le jogging. Que vos intérêts soient l'amusement de l'eau, le golf, le vélo Kettle Valley Railroad, les visites de vignobles et les dégustations ou le ski Mt Baldy, notre objectif est de vous assurer que votre séjour soit confortable, agréable et mémorable. Les chaudes journées d'été couplées aux longues heures de jour sont vraiment énergisantes et thérapeutiques. Profitez de votre séjour dans ce que nous appelons le paradis! This is our first time as snowbirds so we were not sure what to expect. This is a very spacious condo as described, with a lovely view and in a quiet location and a short drive to town. The empty lot or green space next door was always busy with birds, quail, geese, ducks etc. The condo has very nice beds, bedding towels etc. The kitchen is well stocked. A negative was the well used carpet which the owner is addressing for the future. Otherwise we had everything we need for the price. The extremely cold winter made it a little drafty around the patio doors so we did have to block drafts. A space heater is in order for the winter to be cosy. Also be prepared to drink bottled water or bring a filter jug as the water is very hard. There is no common room which was not an issue for us as we got busy and joined in activities. Surrounding hotels and condos offer periodic events you can join in. A shout out to the super and his wife Grant and Audrey for being friendly and accommodating. We loved Osoyoos, both the people and the views. There are many mountain roads to explore and quaint restaurants and bars. We highly recommend the Advantage gym and if you like to curl the people are fantastic there. You will have plenty of space in this lovely condo for even two couples. Property was fine and adequate. Exterior (decks and common areas) were not very clean with multiple cobwebs, Furniture, bedding and kitchen ware is all showing age. Stay was good and there were no problems. Very nice accommodations. Well laid out. Good location. The condo was very spacious and was very comfortable for 3 couples. We spent a great deal of time on the large deck overlooking the lake. The complex itself seems to cater to both families and adults but was not overly noisy. The condo itself was well equipped with everything we needed. Very good value for the money. 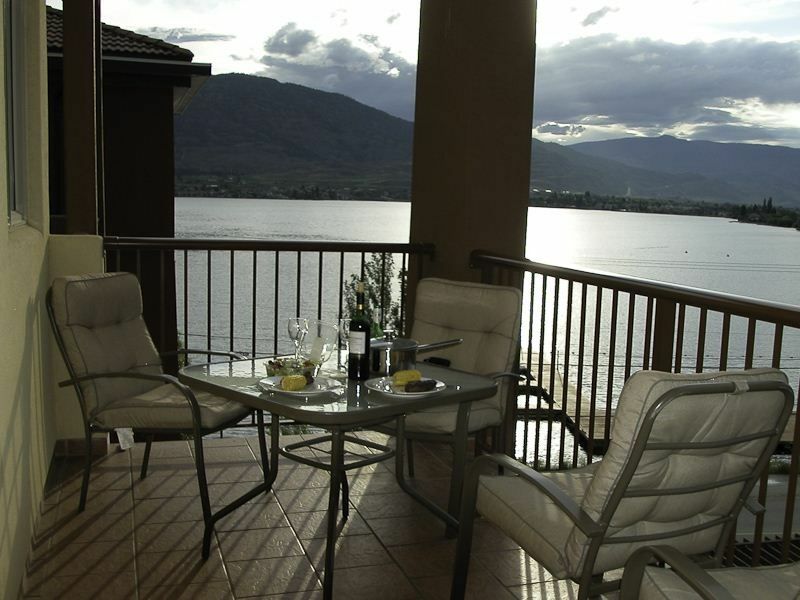 This summer (August 2018) our family spent our 10 day summer holidays in Osoyoos at Harmel & Melanie’s beautiful condo. Everything about the experience was absolutely incredible from start to finish! Harmel and Melanie were amazing to communicate with throughout the booking process, right up until we arrived at the condo. Harmel contacted us our second day into our stay just to make sure we got settled in okay, that everything was in order, and he also checked in with us when we got home from our stay. The condo was beautiful and far more spacious than I had ever expected. Myself, my fiancé and our 4 children (Ages 9-16), as well as his brother and wife, all fit more than comfortably with space to spare. The condo was clean, and extremely well maintained. It was very well stocked with dishes, cutlery, cookware, towels etc. The view from the balconies were absolutely breathtaking, and with being able to watch the boats on the lake, it definitely became one of our favorite spots to relax during our down time. It was awesome having access to the pool on site, and the dock on the lake right across the street. Everything in town was so easily accessible wether you’re driving, biking, or walking. I really can’t say enough great things about this condo, or it’s owners. I can say we were so very impressed that we have already booked for our 2019 summer holidays! I highly recommend staying here! We will absolutely be making this our summer “home away from home” for as long as Harmel and Melanie are renting it out. Thank you again Harmel & Melanie for all your hospitality! Very comfortable, had a nice stay. Le parc d'attractions Rattle Snake est à 15 minutes de marche le long de Lakeshore Drive. Unit is non-smoking. The deposit to reserve your vacation is non-refundable if we are unable to re-book the unit to another party for the dates and duration as your initial reservation.